Collaboration between the three tiers of government and across State agencies is essential for coordinating land use and infrastructure planning and delivery. Engagement with the community and stakeholders is central to all collaboration and is addressed in Objective 6 and Objective 39. The complexities of a growing region mean different approaches are required depending on the context, including nationally significant investment, corridors of renewal and land release, or a focus on a specific strategic centre or precinct. The role of the collaboration also varies. It may be for the development of an integrated strategy where alignment of agencies is critical; for coordination of investment across different tiers of government to achieve land use outcomes; or for the delivery of specific projects. The current suite of approaches supporting land use and infrastructure planning and delivery are outlined in Table 1. The delivery of the Western Sydney Airport and Badgerys Creek Aerotropolis will be driven by a Western Sydney City Deal. It will transform the Western Parkland City into a thriving, productive and sustainable area, with the Western Sydney Airport as the economic catalyst. This will require collaboration of all tiers of government with the Australian and NSW governments working with local governments across the Blue Mountains, Camden, Campbelltown, Fairfield, Hawkesbury, Liverpool, Penrith and Wollondilly. The Western Sydney City Deal will be the single largest planning, investment and delivery partnership in the history of the nation, maximising the advantages of the region to support the emerging Western Parkland City. The City Deal will build on the Australian Government’s commitment to deliver a Western Sydney Airport and leverage other key infrastructure investments to catalyse jobs growth and better transport links (refer to Objective 20). Collaboration Areas are a place-based process led by the Greater Sydney Commission to address complex issues that require cross-stakeholder solutions. This may involve the alignment of the activities of councils and agencies at the NSW and/or Australian Government level, and a range of public and private stakeholders such as hospitals, universities and research institutions to deliver significant regional and district liveability, productivity and sustainability outcomes. exploration: explore and understand all perspectives before finalising recommendations. identify projects and initiatives to deliver the vision. These elements will be documented in a Place Strategy supported by a suite of strategies that best deliver outcomes. 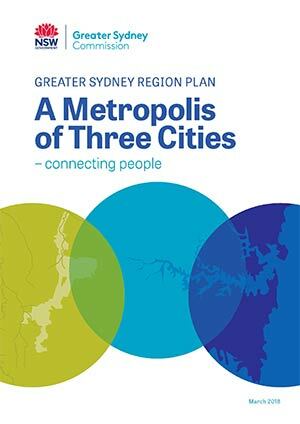 The Greater Sydney Commission has facilitated a collaborative process with key stakeholders to establish a shared vision and whole-of-government approach to the Greater Parramatta and the Olympic Peninsula (GPOP) and is piloting a growth infrastructure compact (refer to Objective 2 and Objective 15). The growth infrastructure compact will provide greater context for the NSW Department of Planning and Environment’s Greater Parramatta Interim Land Use and Infrastructure Implementation Plan on issues such as optimal integration of land use and transport through staging and sequencing. Other collaboration roles by the Commission include providing expert advice on significant regional and district collaborations led by other government agencies such as NSW Department of Planning and Environment’s Planned Precincts at St Leonards, Frenchs Forest and Macquarie Park. The current program for the region’s priority Collaboration Areas is outlined in Table 2 and shown on Figure 9. 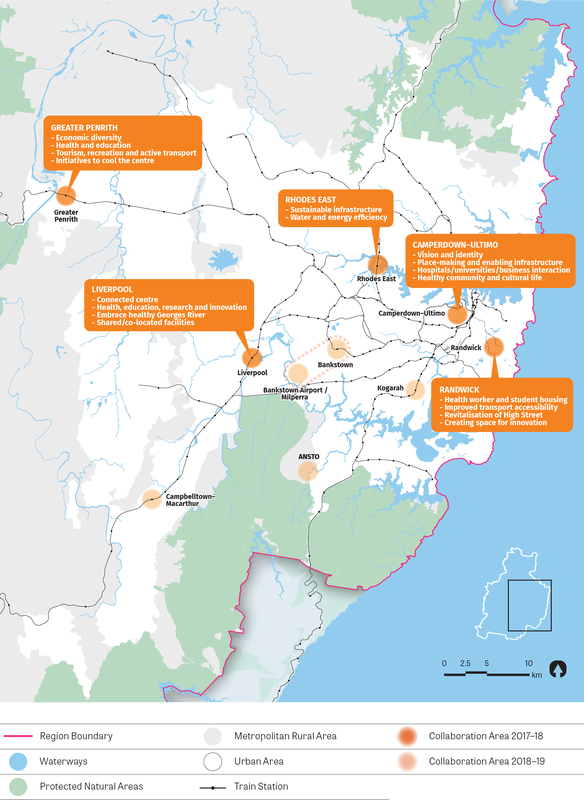 The roles of the Western Sydney City Deal, Collaboration Areas and Planned Precincts and Growth Areas are highlighted throughout this Plan and the District Plans. The Greater Sydney Commission to continue to identify, prioritise and lead Collaboration Areas across Greater Sydney. The Commission will annually review the Collaboration Area program and priorities. The implementation and governance commitments of the Western Sydney City Deal identify that the Greater Sydney Commission will coordinate land use and infrastructure for the Western City District.